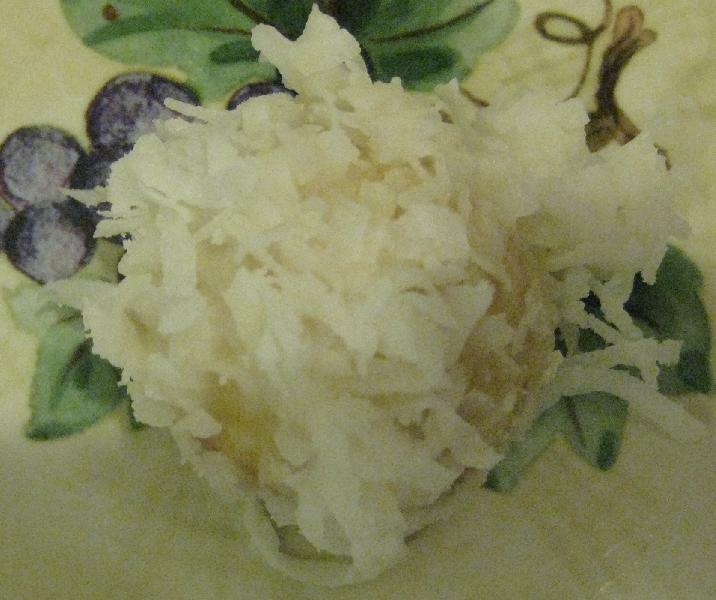 Grind 1/2 cup of the coconut in a food processor. Chop the remaining coconut and set it aside. Add the flour, 1/4 cup of the confectioners' sugar and the salt. Pulse to blend. Add the butter and vanilla - pulse until the dough comes together. Place the dough balls 1 inch apart on an ungreased baking sheet. Bake the cookies until firm but tender about 15 minutes. Remove to a cooling rack and let the balls cool completely. In a small bowl, stir together the remaining 1 cup confectioners' sugar and enough milk until it is smooth but still thick. Dip the cookies in the glaze (about 1/2 teaspoon for each), letting it drip down sides. Dip the cookies in the chopped coconut and set aside for glaze to dry. anonymous : WOW are we going to get fat.